Let me be the first! I love this quilt and want to make one! What a cute quilt. Please enter my name for the Moda circles. Looks like a fun quilt to make. I love circles and the quilt is a sweet one. Thanks for the chance. 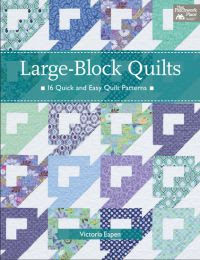 Vickie I love this quilt and congrats on having another project on the Moda Bake Shop site.. I didn't realise Moda had precut circles (sheesh how many precut doodads do they do now???) I've not seen them here in Australia, you are lucky to find charm squares and jelly rolls! What a fun quilt! Love the colors and the circles! HMM, it looks like candy and sherbet! What a great giveaway and a terrific quilt! I love how you finished it up. The tutorial was great on MBS. Now that's a pretty quilt - I've worked with circles and yo-yos before and really enjoy it. Please add to me your give-away drawing. What a fun quilt! Congrats on another creative project on MBS! Thanks for sharing your recipe (and the giveaway, too)! what a darling quilt! & love your blog, happy to find it! It is beautiful. Love the colours. This is an adorable quilt and one that would be so much fun to make. I'd love an opportunity to win the circles. Love it! Love it! Off to the Bakeshop to comment too! Can there ever be too many giveaways! :) This quilt is cute and I am off to read the instructions MBS. i love your quilt 2!!! i realy hope that one day ill know how to make quilt like you do! i know that soon i am going to start practice!! I love this quilt, it is so much fun. It also looks like a fun quilt to make. I loved those candy dots. Your quilt is very sweet. Thanks for the chance. Such a sweet quilt! Just yesterday we had snowcones and the flavor reminded the kids (25 & 27)about those candies when they were little! Thanks for the opportunity to win! What super cute quilt! I'd love to make one!! Thanks for the giveaway! Ooo, Ooo, Ooo, pick me, pick me. I love Sweet, and the circles are really fun. I just found your blog and lucky me -- you're having a giveaway. The candy buttons quilt is darling and I'd love to make one. nice work!!... you are in serious get project done mode! What a cute quilt. I think it would be perfect for my very 1st grandchild expected in another month. Hope I win. Thanks for the giveaway and the great pattern. Yay for you! 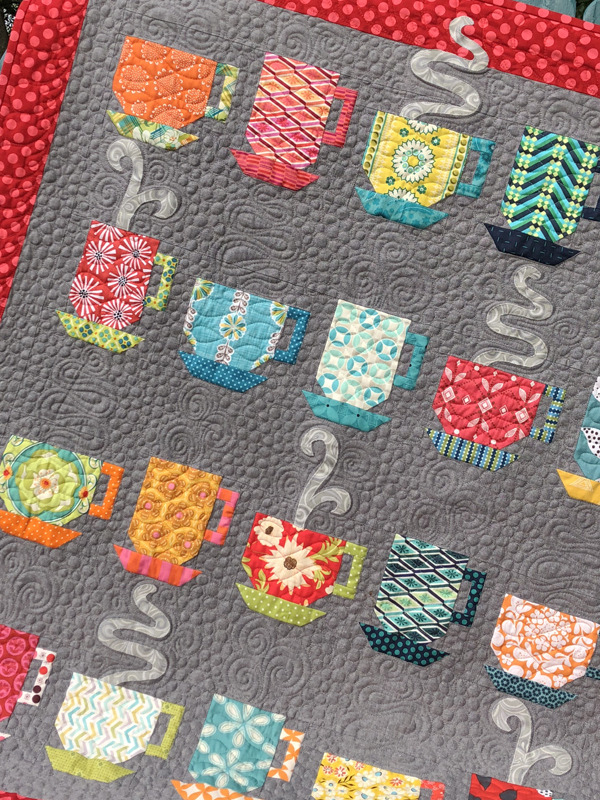 Saw your quilt over on the Moda Bake Shop Blog, and it's so cute! Great job! Very Cute! I would love to make this quilt. I have my fingers crossed. I absolutely love this quilt pattern AND the fabric! I would LOVE to win and make one. Thanks! I love this darling quilt, what a unique way to use the circles! Please put me in the drawing! I love this project! Thanks so much for sharing. I'm just finding your site, and I love it! This is delightful! Love it! This is a great quilt Vicki! The circles and yoyo's are so cute. Cute 'candy button' quilt and love those circles. I'm glad I found your blog. The quilt is beautiful! I'd love to make one for my baby granddaughter! She (and her mom) would love it. Thanks for posting the directions! I love the quilt--you did a wonderful job! I would love to win the circles! Fingers crossed - I want to win this!! Love the quilt. Oh!! I would love to win those pre-cut circles. The quilt is so cute. I'm going to have to make one like that. I love it. What a cute quilt. I would olve to be entered in your giveaway! Don't know if my comment came through, shall try again, love the projects you are creating with your moda. Keep inspiring us. Oh! That is just beautiful. Put me in the draw please. Pre-cut circles, how wonderful. Love your quilt - it challenges my resolve to only finish current projects! I love your quilt! Great directions... and it happens to be one of my favorite fabric lines! I heart "Sweet". Just finishing up a disappearing nine patch using two charms packs, and now I know what I'd like to do with my remaining charm pack! Would be sweet to win those circles too! The quilt is darling! I love those candy dots too! I would love to make this quilt and with your precut circles, I might actually get it to the sewing table. I loved those candy tapes and I love your quilt! Thanks for sharing your work! Thank you for being so generous! I love that fabric. I remember those candies! The quilt is so fun - I'd love to win the circles. Thanks for having the giveaway!!! Oooh...how fun! I loved that candy and those ones that were the wax bottles! Happy Summer! Please let me try my luck here for your giveaway. Vicki- your quilt is so adorable! Very sweet... I love your inspiration for it and although I have the Yoyo maker I have not played with it... but now I will. Thanks for the giveaway! Luv, luv, luv this quilt. Perfect for a picnic. Please enter me. What a pretty quilt. The fabrics remind me of my grandmother's aprons. It's Adorable Vickie -- Soooo Cute! Love the quilt! And would love the circles. Very cute! I still haven't made the last one you posted on the Moda site... I better get busy! Love the colors and love the quilt. Thanks for the giveaway. Very cute quilt. I'd love to start one today!! Oh thank you for this pattern. It is so cute. I have just recently gotten hooked on making yo yos. They are relaxing to do while watching tv. This pattern will work so well with my yo yos. I am also really new to this blogging stuff and I love it. I have learned so much from everyone. What an adorable quilt! I didn't even know Moda was making precut circles. Neat way to use them. such talent! I hope I win this one! anne molino at hotmail dot com! What a precious quilt. I definetly want to make it!! Delicious quilt! So cute and the colors are just divine. The pattern could work for so many different types of quilts - baby boy or girl and even holiday. Absolutely love your quilt and the fabrics you used! What fun, happy colors and circles - too cute! Thanks for the giveaway. Pick me - pick me !!! Oh, I STILL love candy buttons! They are the absolute best! Next to Gummi bears and Pop Rocks, that is! 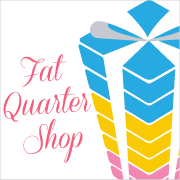 Love your quilt and the candy colors are fab! Loved, loved, loved those candy buttons as a kid! And, now, I love that adorable candy button quilt! Please enter me into your drawing. I remember those candy dots, too! Your quilt is sooooo cute! Please enter me in the giveaway. I love the quilt and the circles - so cute!!!! I can't wait to make one just like it! Thanks for sharing....piece. This quilt is so cute and yummy! perfect for one of my nieces. That looks like a really fun quilt. I love circles, especially if I don't have to cut them! 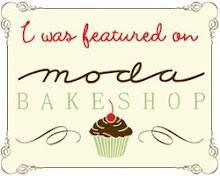 I was thrilled to see your quilt on the Moda Bake Shop! Yo-yo's are so much fun to make, I hope to be your winner!! I think this is just darling!!! What a cheery quilt! Great design job.